I like Heist movies – a lot. I like the big noisy kind such as The Town, the predictable, such as the Italian Job (both versions) and sometimes the star vehicles such as Ocean’s [enter number in the series here]. My favorite Heist type films are the ones with less a violence and more guessing what’s next. David Mamet’s The Spanish Prisoner and Heist come to mind first. Widows from Steve McQueen (12 Years a Slave, Shame) is along this line of film. It is not predictable and the lead characters play people who choose to perform a heist, against their better judgement, and are completely out of their element. Instead of a comedic depiction of people out of their element McQueen delivers a serious take – deadly serious. The reasoning for the heist provides a twist as well. The screenplay for Widows is a collaboration between novelist screenwriter Gillian Flynn (Gone Girl, Sharp Objects) and McQueen. Flynn and McQueen have historically been excellent at depicting the tension of inequity especially if it involves race and gender. Widows does not fall short in this area. 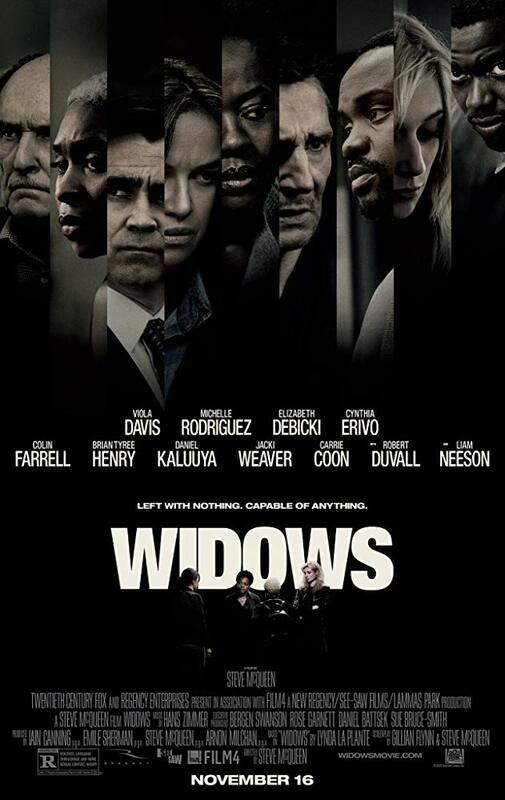 As with most Heist type films Widows involves an ensemble cast – led by Viola Davis and Liam Neeson. All cast members are solid in their performances. Davis as we have come to expect is superb. Collin Farrell is excellent – what a chameleon. While not perfect, Widows is worthy of a theater ticket purchase.